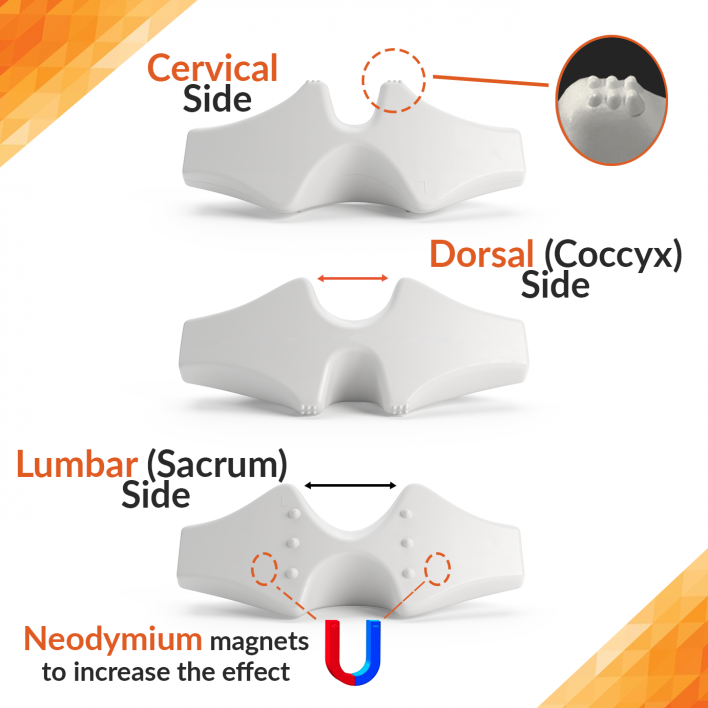 CORDUS and SACRUS can effectively help correct scoliosis up to the third degree. Being part of an integral therapy, CORDUS and SACRUS can significantly reduce the time of your treatment. Scoliosis is characterized by the presence of strong spasms in the paravertebral muscles on one side of the spine, while on the other side there are very weak muscles. CORDUS works precisely, symmetrically and deeply the intervertebral zone and manages to recover the innervation symmetry along the area with the condition, through two processes: 1- the elimination of tension in a muscle side of the spine; 2 – recovery of muscle tone from the other side; in a way that it balances the muscular tone on both sides of the curvature, helping the replacement of the vertebrae to their original position and to the reduction of the curvature. That is why it is very important as part of the integral therapy, to eliminate the asymmetry of the sacrum area (area of ​​origin of the condition), correcting it. This correction is made through SACRUS. It is important to consider that although your diagnosis indicates lumbar or dorsal scoliosis, in reality this condition affects from the sacrum to the cervical area, therefore, you must apply CORDUS throughout your entire spine, with greater rigor in the area of ​​the curvature (Cordus has three sides for cervical, dorsal and lumbar area). Suffer from Scoliosis or Rotoscoliosis? The CORDUS device helps correct 1st and 2nd degree scoliosis problems. For problems of greater degree it is possible to give relief, as long as you do not place the device in the damaged area (curvature). The SACRUS device helps correct scoliosis up to 3 ° grade. CORDUS therapies for the correction of scoliosis should be done in a moderate way, that is, with the use of supports. To treat this condition, basic therapy is used, after 3 sessions, emphasize the damaged area. We suggest that for better results complement the integral therapy of CORDUS and SACRUS with exercises appropriate to your diagnosis to strengthen the muscles of the back and abdominals, check and improve your habits of your life ,Because they can keep harming the problem and can consume some food supplements. For more advice and suggestions read the manual. There are people who have a genetic predisposition to scoliosis and according to some doctors there is nothing to do in this case. We consider that this is a wrong position, since it is very important that people with this type of ailments give a permanent maintenance to their spine. For example: when the person has a genetic predisposition to obesity but their diet and physical activity are normal, this person will not be overweight. The same happens with genetic scoliosis. If the person performs a good maintenance of his spine, by discharging and strengthening muscles and ligaments, he exercises and takes the necessary supplements, he can avoid suffering the pain derived from scoliosis. The important thing is to start as soon as possible. The important thing about the CORDUS and SACRUS devices method, as part of the integral therapy, is that a high level hygiene is obtained in the whole column in a simple and accessible way.